Holding hands… a sure sign of being head over heels. Dubai, UAE, January 07, 2019: Hands entwined every minute of the day? Looks like Cupid's aim was true! At OMEGA, we say it's time to get serious. OMEGA's Tr�sor makes a wonderful gift for a loved one – and goes perfectly with red roses. 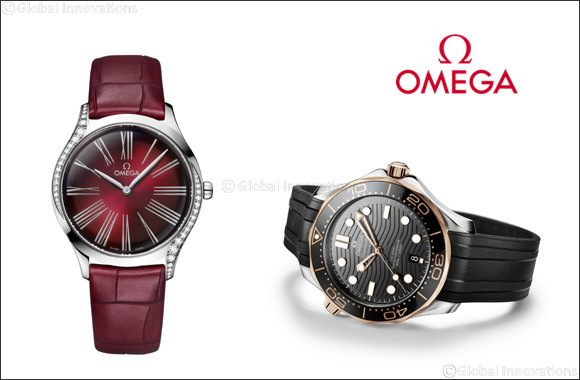 Though it keeps a steady beat, OMEGA's De Ville Tr�sor is designed to get hearts ticking faster, with a dial and leather strap in garnet – a passionate shade of red. As a gift to give on the most romantic day of the year, the Tr�sor ticks all the boxes. Sleek and elegant, the 36 mm model features diamond paving along each side of the case and a single diamond set within the crown. Those in love will have to purchase their long-stemmed roses separately. However, OMEGA's timepiece does include a floral offering that's not only equally beautiful but longer lasting: a flower on each crown, created out of five OMEGA logos in red liquid ceramic. Even the reverse side of the watch is certain to get hearts racing. The caseback of OMEGA's De Ville Tr�sor has a polished, mirror effect and 'Her Time' pattern. Sweep your lover off their feet with the waves of the Seamaster Diver 300M. If you've fallen in love with the adventurous type (and we certainly hope so), we urge you to consider gift-wrapping the Seamaster Diver 300M. This 42 mm watch in stainless steel and 18K Sedna™ gold is ready for anything. It features a black ceramic bezel with a Ceragold™ diving scale, and a black ceramic dial with laser-engraved waves. The skeleton hands and raised indexes are 18K Sedna™ gold and filled with white Super-LumiNova, while the helium escape valve has a conical design. A little mystery keeps a love alive, but there's no reason why you shouldn't be able to gaze directly into the heart of a watch. On the Seamaster Diver 300M, the OMEGA Master Chronometer Calibre 8800 can be seen through the sapphire-crystal on the wave-edged caseback. We can't guarantee love will last forever, but we do offer a 5-year warranty on both of these beautiful timepieces. OMEGA wishes all its customers a happy and romantic Saint Valentine's Day.